With the rebuild in 2017, is there any chance the old Silver Bullet could be re-used on the alignment going up to Rough Rider Basin/Thunderhead as part of that plan? Thoughts? Perhaps they are simply upgrading the cabins and introducing new gearing for 6 m/s? Will it still be a 8 PAX? For $15 million, it has to be more than just new cabins. 3,600 would normally mean 10 passenger cabins but they didn’t specify. With another base lift to get up to at least where the Gondola unloads, they could probably do away with Christy III which is only used as backup to CE and on very busy days.. I don’t see how they achieve a capacity of 3600/hr without going to 10 passenger cabins. To keep it at 8 passengers, it would require a loading interval of only 8 seconds which is impractical without double loading. Notice how on the current gondola the cabins are spaced as close as they possibly can be on the straights and how the turnarounds speed up so they are roped off and people can’t load there. If they tried to build an 8 passenger gondola with that design capacity and no double loading, it would be way too fast for loading and the speed would be turned down, negating any capacity increase. They poured a lot of money into that lift over the summer (hangars, grips, tire banks, tension, return bullwheel, controls, and more) and it will be interesting to hear what, if any, of that can be used on the new system. I will be looking forward to more updates from Steamboat. Nevertheless, exciting upgrade for one of the most signature lifts in the state! I can tell you atleast right now they don’t have guests load on their own. They have staff on hand to load equipment for guests and they have a foreman of sorts who directs guests to make sure they get 8. If they were continuing with this method they can load that gondola quite quickly. They also only load on the straight part as someone else pointed out. I was hoping for the new lift to the left of Pioneer, especially after the remodel, gapers win again. Is there a chance that this new lift could be a D-Line? Are they going with a direct drive like the new instal at winter park? The biggest problem with the current gondola is its inability to service both passengers and food service adequately. 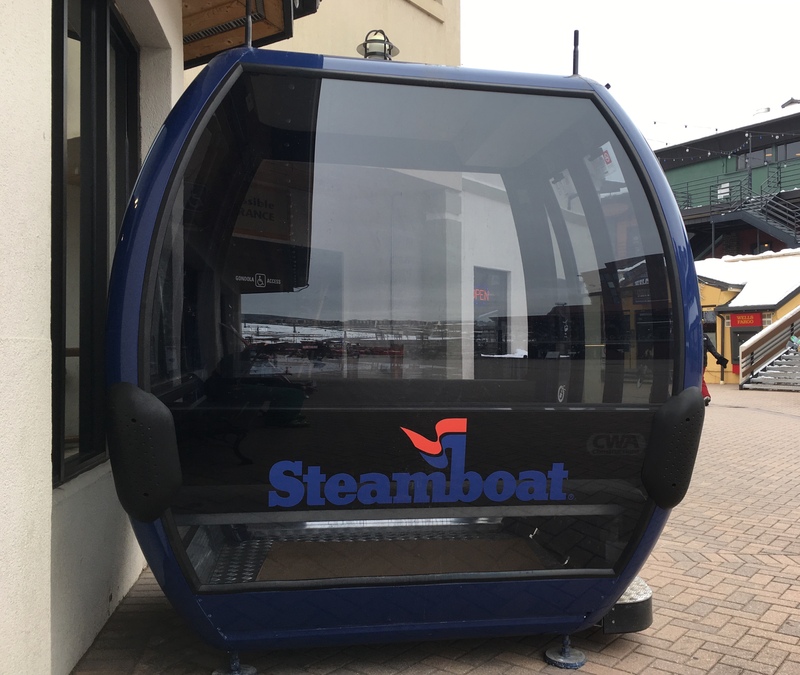 The current gondola has four gondola cabins that are dedicated to bringing food up the mountain and every time they enter the top or bottom of the lift, the entire gondola slows down to a crawl as the food and beverage manager for Steamboat refuses to use other means, like snowcats. Hopefully the new system will allow for these select cabins to come off the line on the fly and allow employees to unload the cabins without slowing down the line speed. The new gondola system also is way more sensitive to wind than the old gondola because of the requirement of new wind sensors. With the slightest breeze at the top of Christie, the gondola slows down to a crawl making the trip take 4 times longer to get to the top. Not sure what they can do to get to a higher capacity unless they funitel or 3s system is installed, but that’s pretty impractical as both terminal structures (restaurant / mountain operations) would have to be heavily modified to accommodate such an elaborate system. The cargo cabins are quite helpful to have and a necessity for the operations at the top of the gondola- snowcats would not be sufficient for the amount of food and garbage a swell as retail that needs to go up that lift, its really not a big deal to slow the lift long enough to unload the cargo cars.. I think they are replacing because they are unhappy with the work done on the current lift from my understanding… new technology will have its perks, but also that auto slow can be a pain, but parameters can be set for this as well. Its not like the just slowed it down for 10 seconds or so to transfer the food cars on and off. The lift slowed to a crawl for well over a minute or even fully stopped. They should design carts for food and garbage that can be loaded into the regular cabins with the seats folded up. The new system will have level walk in cabins for sure, making this much easier. If this can’t be done, then they need to only do deliveries to and from the lodge during hours when the gondola is not open to the public. Hopefully this lift will get Omega V cabins. I hope they replace the whole thing and not just upgrade it with new cabins and new drive equipment. It might get to the point it would be cheaper to replace the whole thing than keep upgrading components. At the same time the gondola would look alot nicer. Never knew it was the first MGD-8 though. They say it is a new gondola. For 15 million they have to be upgrading more than just the terminals and cabins. There will likely be new towers and line gear as well. They may reuse the hanger arms if keeping it an 8 passenger gondola. They replaced the hangers last year so I’m guessing they will keep those around as they would just wait if they didn’t want to keep them. Strange how I feel as passionate about the Steamboat Gondola as I did for the old Wildcat chair and other lifts at my beloved Snowbasin. I’ve hardly spent any time at Steamboat, yet it seems to be my favorite Colorado resort to study and frequently check on the webcams for. It’s a beautiful village and beautiful community. A bit off topic. Have you rode the new wildcat yet? Snowbasin is getting lots of snow right now and they are trying to open porcupine. No, haven’t skiied there in years :( Bad knee but working on it. They did get Porky open today though! Chairs are looking a bit rusty :( Bring on Beckers and Strawberry!! The galvanizing on the hangar on that chair looks like its starting to wear off. Shows how tough stadeli chairlifts were built. Wish snowbasin would add a seat pads to becker and porky like on middle bowl. its difficult to load if you are a beginner because of the hard plastic seat. Porky got new climb out sheaves this winter. Oh definitely. Stadeli knew how to build heavy duty fixed grip lifts! From what I understand they would spec the drive components to be a bit over what was needed as well. Thanks for the update on Porky. I knew they were doing some moderate work on it this past summer and I was told they were doing moderate work on Becker as well, so may want to check into that. I started riding the twins when they were only a year old after graduating from Littlecat back in the 80s. Smoooooooth as butter is what I remember. As for Middlebowl.. I hope it stays for a long time to come, but wouldn’t mind them adding some safety bars to the thing.. you know why. Any chance of the gondola being relocated somewhere? There would need to be new terminals created for it if they did- The current terminals are integrated into bottom multi-level offices and the top terminal integrated into the top Thunderhead Lodge, I believe. With cabin parking up top. So are they getting 137 all new cabins or are they adding 12 new ones to the line? Story updated with more details on the upgrade. Sounds like the 2017 components are staying and this project will replace the rest. GOOOD. I would hate to see all that money they spent in 2017 thrown away like that. Courtesy of Snow Brains, FWIW. 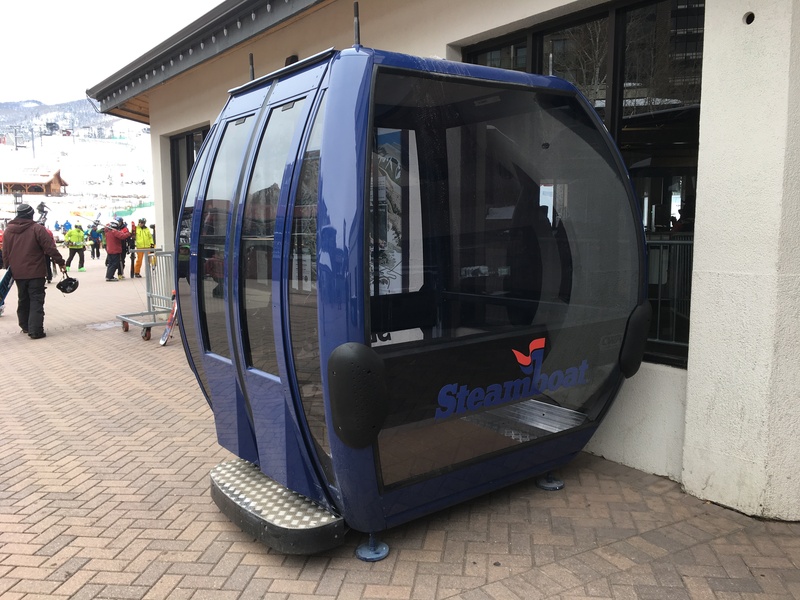 The Doppelmayr-designed gondola will feature new level-walk-in cabins, plus an additional 12 cabins added to the line, increasing from 125 to 137 total cabins. The current ride time will go from 12 minutes to less than 10 with increased speeds from five meters per second to six meters per second, increasing uphill capacity nearly 38 percent from 2,600 people per hour to 3,600. The new gondola cabin design will allow the resort to streamline freight hauling, eliminating guest impact while hauling more than 10,000 pounds of food up per day to support on-mountain dining. 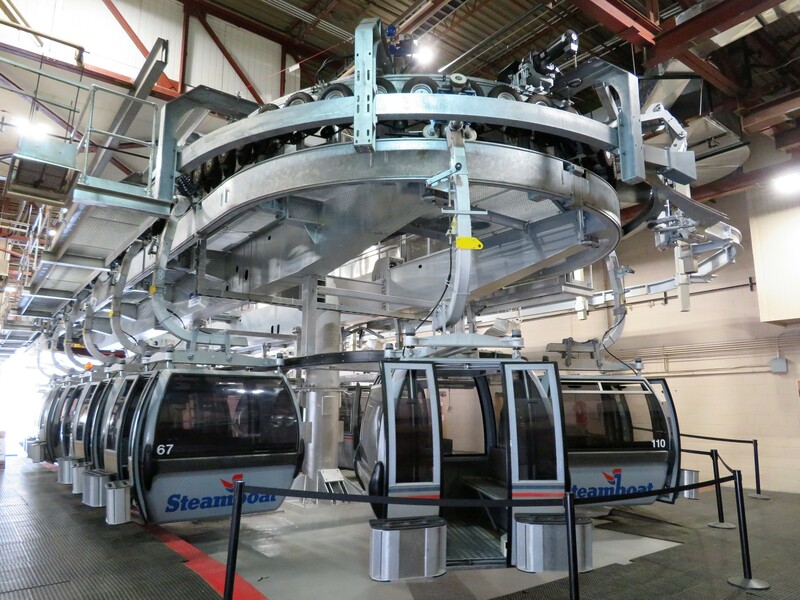 The new gondola will feature all new drives, brakes, line equipment, and top-station bull wheel, along with all new towers to support the new machine. It’s like they’re asking everyone to scratch the windows with their equipment. Coolest ski rack ever was on the old Wildcat Gondola. Some gondolas in Europe have a great solution to the ski rack problem. Inside the cabins, there are slots in the floor. Everybody’s skis can slot into those slots and then all of the skis are neat and organized. If Steamboat is not going to add racks to the cabins, they should use these slots instead. I wonder if Steamboat will use the new Omega Vs for the new cabins. If so, what features would they opt for? This is most likely not the exact cabins they are getting. Looks like an Omega III so it’s probably just an extra cabin Doppelmayr had lying around as is the case with most demo cabins. The actual ones may have ski racks, but they went skis inside for Winter Park.